By using multiple cameras placed in different locations, and with exposures simultaneously triggered by a radio-controlled release, Barbara Probst dissects the photographic moment. 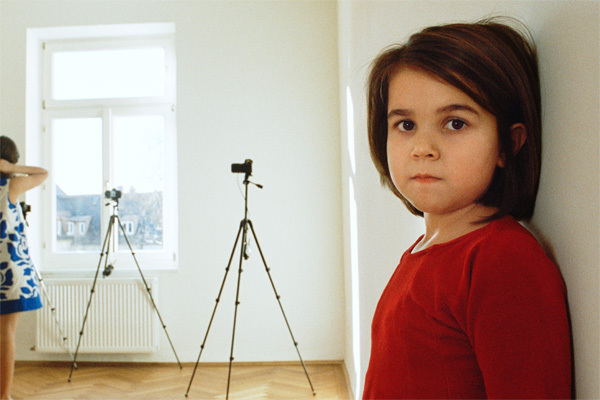 The mise en scène of Exposure #55: Munich, Waisenhausstrasse 65, 01.17.08, 1:55 p.m. (2008) is a sparsely furnished apartment. Twelve cameras, disposed at various angles and distances, peer through keyholes and doorways and around furniture, framing figures in ambiguous arrangements. Cameras take photographs of cameras taking photographs of cameras. The viewer enters a labyrinth of vision with no easy route out. Born in 1964 in Munich, Barbara Probst divides her time between New York and Munich. She has received the Philip Morris Award in Dresden (2002) and the Photography Award of the Arts Council in Munich (1994). She has had solo exhibitions at the Kunstverein Oldenburg (2009), the Madison Museum of Contemporary Art (2008), and the Museum of Contemporary Photography in Chicago (2007); and been in group exhibitions at major museums worldwide, including the Saint Louis Art Museum (2012), the Tate Modern in London (2010), the Centre Pompidou in Paris (2010), and the Museum of Modern Art in New York (2006, 2010).In October 2013, she will present a solo exhibition at the National Museum of Photography in Copenhagen. Probst is represented by Murray Guy Gallery in New York, Kuckei + Kuckei Gallery in Berlin, Monica de Cardenas Gallery in Milan, and Galleri Lars Bohman in Stockholm.